QuickBooks Online Self-Employed is a thinned-down version of QuickBooks Online with a very specific focus: Sole proprietors and small business owners who mix business and personal accounts, who pay quarterly taxes, and who need to do quick triage on business and personal income and expenses. 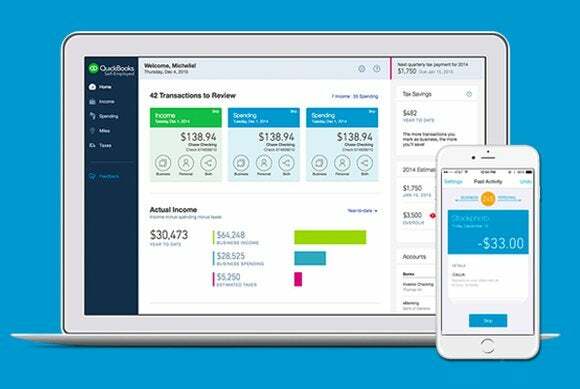 QuickBooks Online Self-Employed performs its magic with the combination of a Web app and an iOS app and makes it easy to quickly separate your business and personal expenses. QuickBooks Online Self-Employed is small business focused, which is to say that it’s aimed at business owners who are sole proprietors or LLC owners without partners, and who write off business expenses using a Schedule C when filing their personal taxes. The assumption on Intuit’s part is that the people who own these types of businesses often have a commingling of business and personal credit card and bank accounts and that it is often difficult using traditional accounting applications to quickly and easily separate business expenses from personal expenses. QuickBooks Online Self-Employed offers a slimmed-down set of features to simplify separating your personal expenses from your business expenses. To begin using QuickBooks Online Self-Employed you first need to link the bank and credit card accounts you want the application to track. Adding accounts is simple: Use the search field to find your bank, enter your login information, then select the accounts you want to use. As is the case with QuickBooks Online, once you link accounts, QuickBooks Online Self-Employed will continue to automatically import all transactions associated with those accounts. After your initial import, you have a few tasks. First, you need to categorize your expenses, just like you would in a desktop financial application. 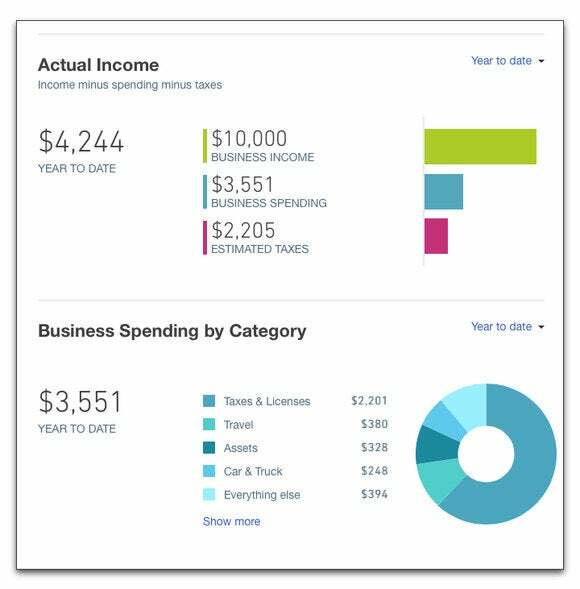 Once you categorize an expense from a particular vendor, QuickBooks Online Self-Employed continues to categorize expenses from that vendor in the same way. Every time new transactions are imported, you can verify the expense and make sure the categorization is correct. 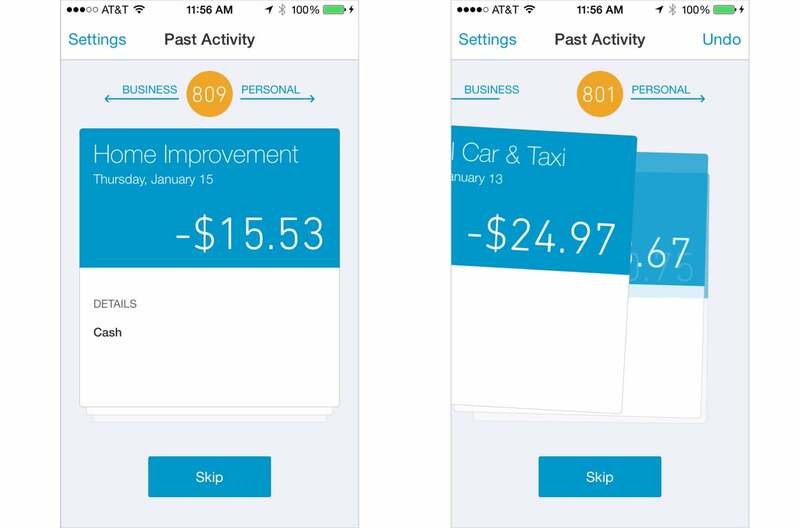 The QuickBooks Self-Employed iOS app makes quick work of separating your personal expenses from your business expenses. The fun begins once categorization is complete, as that’s when you split your expenses into two piles, one for business expenses and the other for personal expenses. (I hereby admit that my “fun” bar is pretty low.) For this task I highly recommend using QuickBooks Online Self-Employed’s iOS app, as it’s much faster and a little like playing a game dealing cards from a deck. As the app presents an expense, you swipe left to mark it as a business expense or swipe right to make it a personal expense. It is possible to perform this same task using the Web app, but I found the process less efficient, particularly when using the QuickBooks Online Self-Employed home screen, as it often hung after one or two clicks. Once you’ve split your transactions into personal and business expenses, QuickBooks Online Self-Employed hides your personal expenses and only displays your business information. Graphs display your business income and expenses and provide information on your estimated quarterly tax payments. You can also see a breakdown of your expenses by category and a full Schedule C breakdown of your income and expenses. QuickBooks Self-Employed provides you with simple tools for viewing your tax liabilities and for printing your 1040-ES. The software has a nice tool for tracking mileage so that you get a proper deduction on your taxes. Using the Web app, you add trips and the miles you’ve travelled and QuickBooks Online Self-Employed uses whatever the current IRS mileage rate is to calculate your deduction. Alas, this feature is not fully formed, particularly with regard to the iOS app. The most obvious implementation of this feature would be to have a something within the iOS app to enter beginning and ending mileage while you’re in the car and have the app automatically calculate everything else. Instead, you’ll need to use some other tool to collect mileage information and then manually enter it in the Web app. What QuickBooks Online Self-Employed does quite well is help you take the guesswork out of determining how much actual income you’re making throughout the year. By taking your income and reducing that number by how much you’ve had to spend and how much you expect to pay in taxes, you can easily see how much money you’ve actually made in real, spendable income on a biweekly, monthly, quarterly, and yearly basis. Simple graphs provide clarity on what you're spending and how much your business has actually made. As anyone owning a business knows, there’s nothing worse than calculating your taxes at the end of the year, only to discover that, not only do you owe a fair amount of money to the IRS, but, in addition, you also have to pay the IRS penalties because you should have been paying quarterly estimated taxes throughout the year. 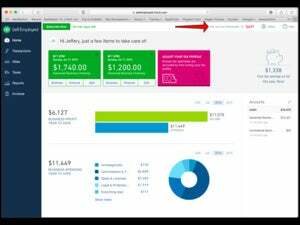 QuickBooks Online Self-Employed keeps track of how how much you should be paying in quarterly taxes, warns you in advance of when the taxes are due, and automatically enters information into your 1040-ES so you can print it and send it with a check to the IRS. Plus, no surprises here, you can export all of the information you collect using QuickBooks Online Self-Employed directly into Intuit’s TurboTax application. 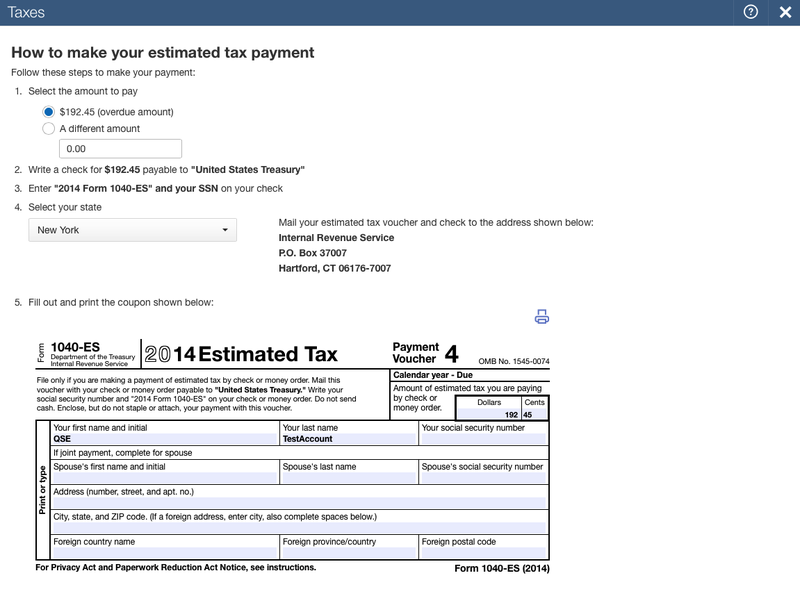 When it's time to pay quarterly taxes, QuickBooks Self-Employed automatically enters information into your 1040-ES so you can print and send it to the IRS. QuickBooks Online Self-Employed lacks some features I’d like to see, chief of which is some kind of tool for creating invoices or digital receipts. I don’t expect the application to be a full-fledged accounting tool for smaller businesses—it’s definitely more Quicken on steroids than a trimmed-down QuickBooks. But I’d appreciate a simple way to provide customers with proof of work completed, which would also serve as a means of linking income to a job or task. The Web app also provides little in the way of reporting. It does provide a nice graphical breakdown of your income and expenses, with a focus on how your business is doing, and the option to view a Schedule C breakdown. But it would be useful to have a small set of built-in reports, like income and expenses, profit and loss, or at the very least a CSV export of income and expenses. QuickBooks Online Self-Employed is an intersting application with a very specific type of user in mind. 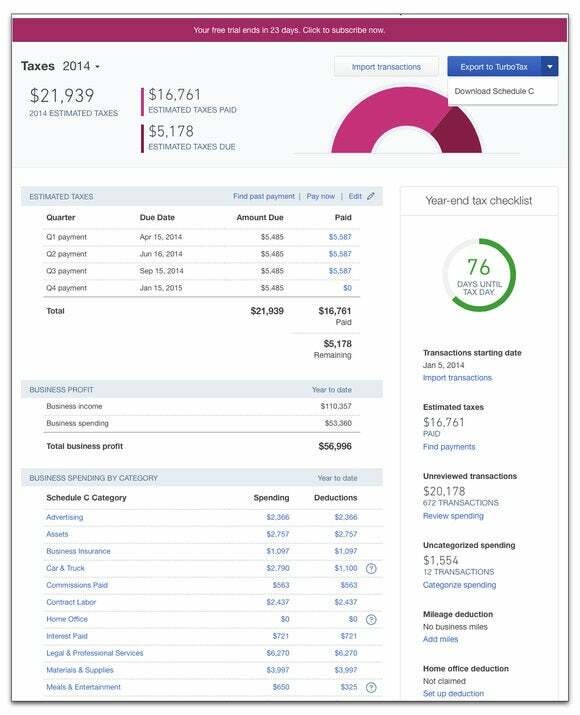 If you’re a sole proprietor or small business owner who doesn’t have to file a separate set of tax forms for your business, and you commingle your personal and business income in the same checking and credit accounts, QuickBooks Online Self-Employed will help you make the most you can without having to pay more than you should to the IRS. 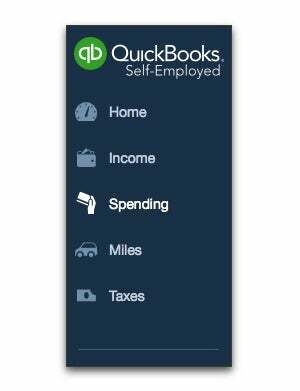 QuickBooks Self-Employed offers simplified income and expense management for small business owners who commingle business and personal accounts and need to pay quarterly taxes.